privatecare.co.za | When you need it most! Medical emergencies can occur at any time. It’s always unexpected. Response time, correct treatment, proper transportation of a sick or injured patient, is vital to ensure the best possible health outcome. Private Care Ambulance Service was started by Tommie and Thea Marx in August 1999. Since then they have provided a well-managed service in the Kouga, Koukamma and Tsitsikamma areas. Based in Humansdorp and Jeffreys Bay. Private Care Ambulance Service is a recognized leader in Private Emergency Medical Service in the Kouga, Koukamma and Tsitsikamma district. We are based in Humansdorp and Jeffreys Bay. Private Care provides quality pre-hospital care to patients in the Kouga, Koukamma and Tsitsikamma areas. Private Care’s dedicated staff ensures that all patients are treated with the respect and dignity they deserve in their time of need. 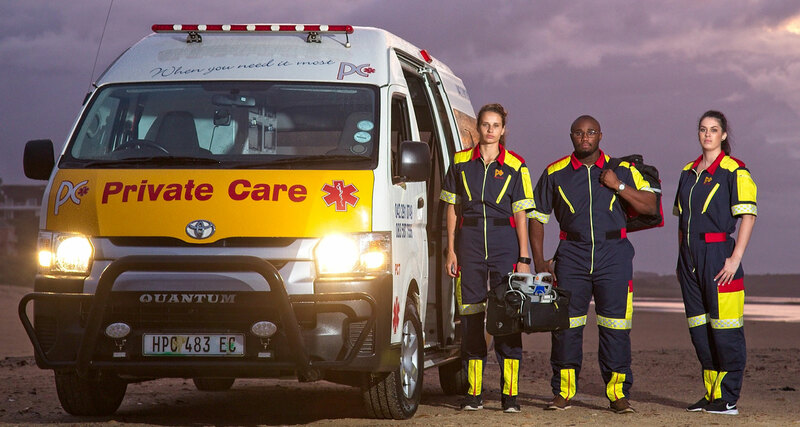 Private Care Ambulance Service is a recognized leader in Private Emergency Medical Service in the Kouga, Koukamma and Tsitsikamma district. We are based in Humansdorp and Jeffreys Bay. 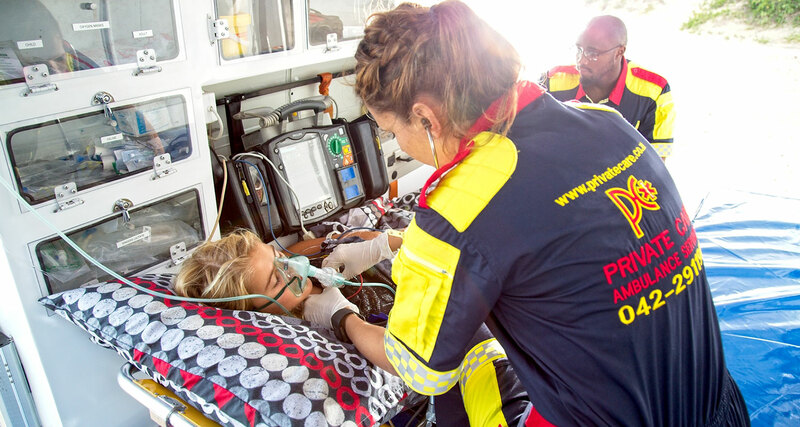 Private Care provides quality pre-hospital care to patients in the Kouga, Koukamma and Tsitsikamma areas. Private Care’s dedicated staff ensures that all patients are treated with the respect and dignity they deserve in their time of need. Our Staff is determined to achieve and maintain the best and highest clinical standards in all situations. We strive to provide the best response times and medical expertise in the local EMS industry, National and International protocols, training, equipment. Our Services are constantly measured against national and international guidelines, to ensure that we provide the best care to the public. Private Care is a service provider to most medical aids, can be contacted directly for emergencies, whether you’re in need of Advance, Intermediate or Basic life support. Long Distance Transfers: These trips are often from outlying areas who do not have suitable medical facilities to the nearest appropriate facility. Trips can also be accommodated to any area in South Africa. Stand-by Duties:It mainly involve sport events such as rugby, cycling, marathons etc. and it often involve the public and the competitors. Also big functions and parties. Medical Equipment: Any medical equipment can be purchase at our premises prior to arrangement. Specialty stock, including first-aid boxes and refill kits are always available. Training: Please refer to the training section for more information. They are offered at our training centre in Humansdorp or it can be done at a requested premises, if found suitable. Our instructors have been exposed to pre-hospital care for a number of years and therefore they are in a position to apply their practical skills and knowledge to all theory that is being taught during courses. Practical assimilations are part of our learner program. 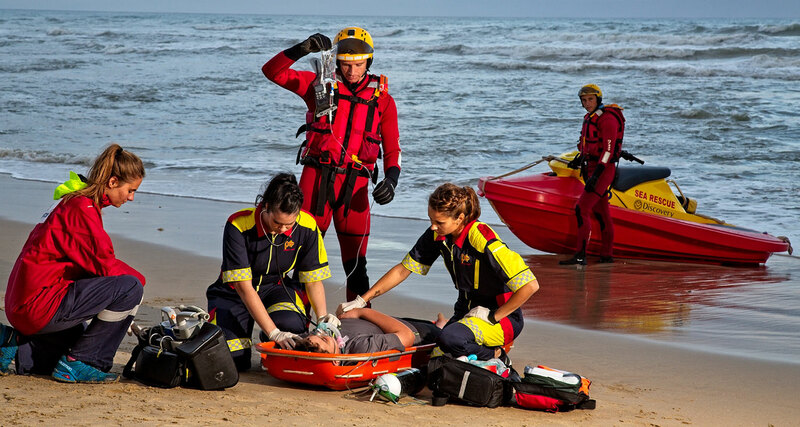 All courses, with multimedia teaching material, are done under the auspices of South African Red Cross Society (SARCS) and endorsed by the Department of Labour. You can also contact our office for more information, 042 291 0749. First Aid Level 2 (3 day duration) – Include Adult/Child/Infant CPR. First Aid Level 3 (5 day duration) – Include AED Training, Adult/Child/Infant CPR. All candidate who pass the examination will receive a certificate, Authorized by The South African Red Cross Society. All courses comply with the most recent updates in CPR and includes Occupational Health & Safety introduction. American Heart Association (AHA) guidelines accredited by the Resuscitation Council of Southern Africa provide all Healthcare Workers with the latest update in CPR and provide registered Healthcare Providers with ±15 CPD Points.